3/18: Reflect. A important card message from the cards. 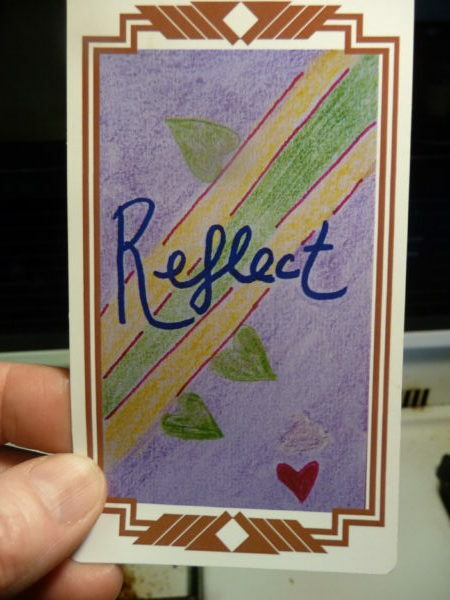 Yesterday I pulled the card REFLECT. I remember drawing this card, but I’d completely forgotten the message I’d channeled in around it. ” It’s so easy to keep going forward, isn’t it? But taking the time to reflect on where we’ve been, what we’ve accomplished, and where we are, right now, at this very moment, is such an important gift to bring to ourselves. Reflection reminds us why we are here. It helps us see how the Light is moving with us and through us. It helps us course correct proactively, instead of reactively. Take time to reflect, dear one, and enjoy seeing yourself move through time and space as your soul path unfolds. Sounds pretty important and life affirming, doesn’t it?